The privacy notification is necessary for legal reasons but does anyone have any suggestions for how we could improve it so that it integrates with everyones sites better? Hi, I think just a simple thin bar which goes the full width across the bottom (or top) the screen would work better. In the same way as you see a lot of EU cookie law notices. Can you add an option in the backend so that a webmaster has the option of choosing how the script is configured so that the notification does not show at all? I won’t be adding them to any sites with that kind of notification until this is resolved. Hmm yes an option of how it may display would be good if it is needed for legal reasons. I like being able to use it on various websites that we haven’t been able to place direct advertising on before as they are service selling based websites and having Adsense or other similar advertising wouldn’t be seen as professional. An obscure popup that meets privacy but fits in with the design of the website and optimisation of the website would be perfect to not distract potential new clients coming our way on these websites. I think what we will do is check out some of the EU cookie type pop ups from major sites as that is what we are really looking for. We will design a few examples based on this and ask the community which they prefer. Obviously it has to be very generic style wise as it needs to fit in with everyone’s site. or even better I would even more prefer to have a static notice on my website – eg, in the header, footer or sidebar – I’m 100% comfortable with a static notice and it does need to be so small it might be missed – happy for decent size static notice on every page if in header, footer or sidebar that when clicked on pop ups the full terms including any opt outs – etc compared to a pop up that actually pops up on hitting the page. – consideration is to have the option for publishers – either a standard popup like a EU cookie popup notice or the option to have a static notice published. OK I think everyone in the team is going to have a go at redesigning this but here is my first effort. It’s completely responsive all the way down. I hate using Arial but have to stick to websafe fonts, tried to make it less crappy by increasing the letter spacing. Privacy links are still visible on mobile. We probably need to do a logo redesign at some point as well. Functional, simple but not particularly swanky. can we change the privacy notification into something like this.. more ui friendly. cause the old one looks alarming to our website visitors. 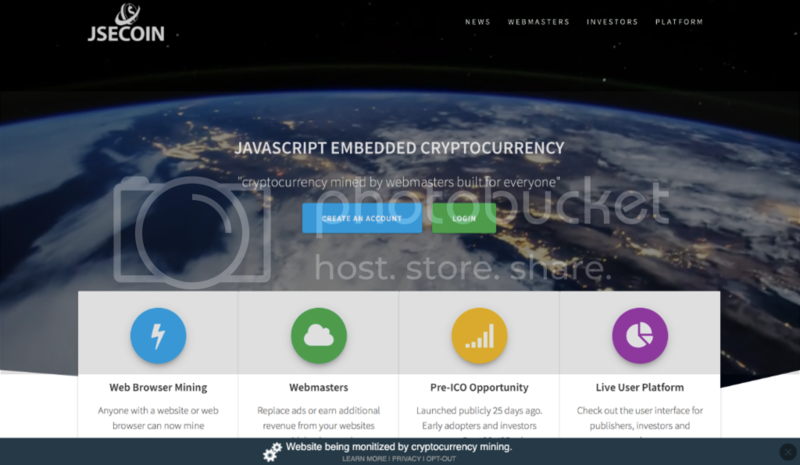 Maybe put the links under “Website Monetized With Cryptocurrency Mining” and not in one side to get everything more compact … That would be my only sugestion but I like the old small ad that was before. Btw, I am getting problems to log in into the site. Is this becasue the updates? Thanks guys, I really like webdevs design how does everyone feel about having a dark blue background? I think it looks better but wasn’t sure about it contrasting with some users sites color schemes? P.S. Juanmi yes the login was down this morning for about half an hour, apologies for that, should all be back up and running now. Space is at a premium too so would have to shorten these. Don’t know. I’ll put it to the team and see what we can come up with. If anyone has any ideas leave them here.